Good people are the first to turn down help when they need it -- that's what volunteers at the livestock supply point in Pampa said of the ranchers turning down the donations. "They're being hard headed and they want their neighbors to be taken care of [first]," said volunteer James Schroeder. "They think they can take care of themselves. But this is for everybody, and everybody needs to come get it." There's more than enough hay for all affected ranchers and their neighbors. "Come get it or let us know you need it and we will deliver it, or let us know your neighbor needs it and we will get it to them," said Danny Nusser, the Texas A&M AgriLife Extension Service regional program director in Amarillo. Nusser said all three livestock supply points have plenty of hay for everyone affected by last week's wildfires. Hay donations have poured in from all over the country, and there is now plenty to go around. "It's been real hard talking to some of these guys," he said. "Just seeing the looks on their faces. It's hard." 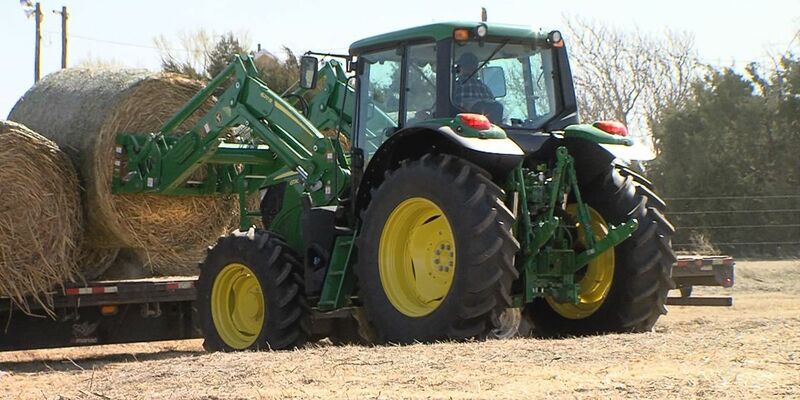 Agrilife also said the focus is now shifting away from hay collections and more toward fencing and long-term needs. "If we see there is a need for more hay, we have lists of individuals just waiting to be called and eager to help," Nusser said. "We have people on our list who are offering acreage for grazing for anyone who needs to move some cattle for a few months. Now our focus is to get the donated material out to the ranchers and their livestock." Mike Jeffcoat, an AgriLife Extension agent in Gray County, said there are currently about 5,000 bales delivered or in supply. "We are asking producers who are thinking about donating to shift that thought process away from immediate needs and to start thinking about fencing and the long-term now. We are going to reevaluate where we are with our hay in the middle of the week." "We would like to know your needs," said Jeffcoat. "We have dump trailers we can put hay on, pull in your yard and make sure we get hay to you. If you think in any way in the next three weeks you are going to have a hay shortage, let us know." Nusser added that ranchers need to make sure they are documenting their dead cattle numbers and getting that information to the proper agencies so they can qualify for assistance in the future. "Contact your local Farm Service Agency office and let them know you were affected," Nusser said. "It's a continuously changing story on what needs to be done and what is being done day-to-day, especially since the fires continued in some areas for multiple days. Now with the fires out and decisions being made about where to go and what to do with the cattle, these ranchers need to be aware of what is required of them." When it comes to burying dead livestock, there are some rules ranchers must follow from the Texas Commission on Environmental Quality. Ranchers need to have a third party witness the burial to help document the number of dead animals. If more than 10 head are buried in a single location, a record must be in the deed. The complete rules can be found here: http://www.tceq.texas.gov/. Those who have lost cattle, fences and buildings should document the losses with the U.S. Department of Agriculture's Natural Resources Conservation Service and Farm Service Agency. Ranchers need to document whether cattle were sent to the renderer or packer or were buried. Documentation will be needed two or three months down the road when applying for aid from potential future government emergency relief funds. The most important thing needed in the near term is for ranchers with losses to make contact with the FSA office and get protocol and directions.This needs to be done within 15 days for some programs and 30 days for others, so call your FSA office as soon as you can. This information is a critical best management practice that needs to be documented for income tax and any potential government financial assistance in the future. The numbers need to be documented for county purposes, whether the individual intends to seek financial assistance in the future or not. – Emergency Conservation Program, a cost-share program that will help restore fences and some structures that were burned. It may be several months before a rancher would see any money from it. – Livestock Indemnity Program, which basically pays for losses of livestock, will take time also. Ranchers are advised to keep good accurate records and have a third party witness any death loss. – Environmental Quality Incentive Program funds also could be used to rebuild some of the infrastructure once the perimeter fences are built and possibly for some grazing deferment. "The FSA offices need to know how much fence in terms of miles will be needed," Nusser said. "Also, how many dead animals do we have out there. The closer we get to reality, the better argument we can make. My recommendation is to go to your local NRCS/FSA office and turn in the information about what your losses are. That way we can get a true handle on the situation. Communication and accuracy is key to requesting support."